I planted red kuri squash in my garden this year, and I wish I could say I grew the one below. Sadly, my plant didn’t do well at all, so I picked this one up at my local natural foods store. 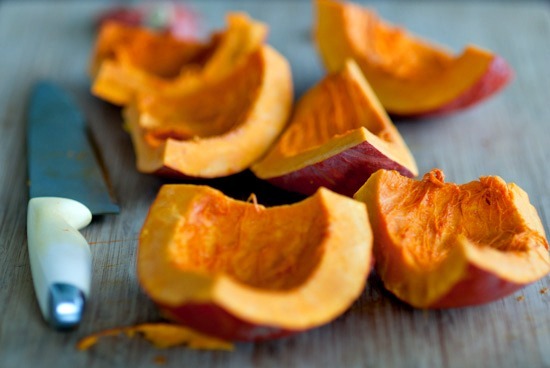 If you’ve never tasted this variety of winter squash, you are in for a real treat. 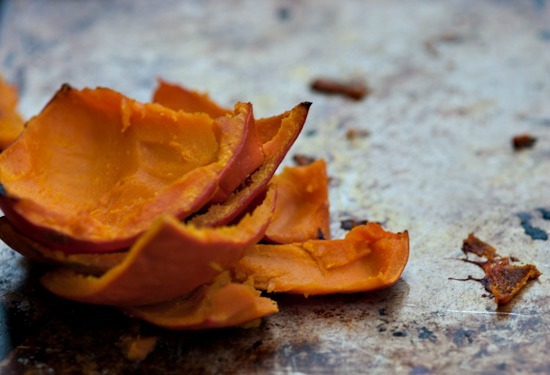 Red kuri squash is very sweet, with a naturally creamy texture. It reminds me a lot of kabocha squash. 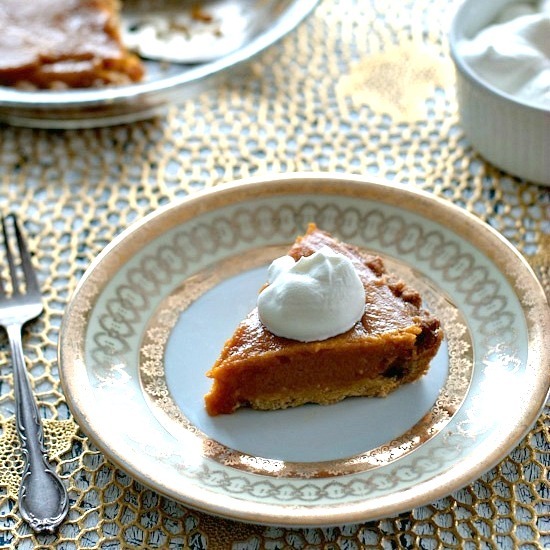 This pie recipe is one I’ve made before with well-drained fresh pumpkin purée. I’ve also used organic canned pumpkin, and you can certainly go that route if you like. 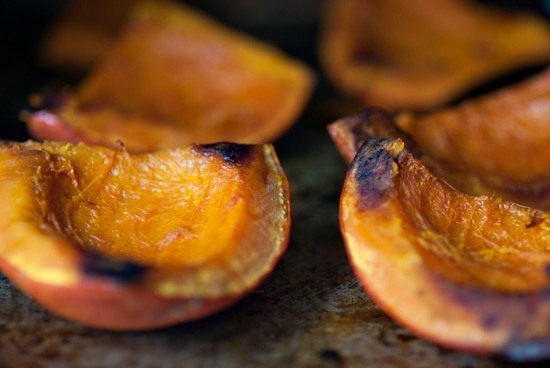 You could also try it with butternut or another kind of squash. Keep in mind that if using pumpkin or another type of squash, you will probably want to add more sugar to the pie filling. I used only 1/2 cup of sugar in this recipe because of the intensely sweet flavor kuri squash develops when it’s roasted, but I’ve added 3/4-1 cup of sugar when using pumpkin. In addition to requiring less sugar, another reason I like using kuri squash is that the purée does not need to drain the way homemade pumpkin purée does: it doesn’t contain much moisture which makes it ideal for pie making. 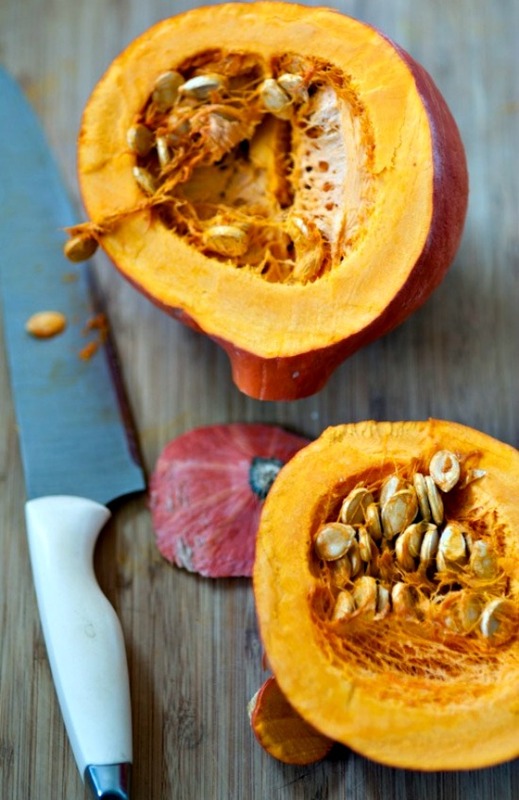 Kuri squash has a thick skin so you’ll need a heavy-duty knife to cut it in half. Once you do, you’ll scoop out the stringy stuff and the seeds just like you would any pumpkin or winter squash (the seeds are great roasted and seasoned). Then, you can cut each half into smaller pieces, and drizzle them with a little oil (I used olive oil). Turn the pieces flesh side down, cover with foil, and roast in a 375 degree F. oven until they’re very soft (40-45 minutes). If you prefer, you can steam the pieces until soft instead. Note that I opted to spice the pie filling only with cinnamon and ground ginger, but you could also add a bit of ground cloves or nutmeg, if you like. Now, at the risk of inciting a riot, I’ll let you know that I do not usually bother with making traditional pie/pastry crusts (aka pate brisee). Sorry, but I just don’t love the way they taste. I prefer to make press-in cookie-type crusts (or sometimes I use nuts, dried fruit, and maybe some unsweetened coconut flakes instead for a healthier option). For this pie, I made a shortbread crust with whole wheat pastry flour, and I added some crystallized ginger to give it a little “oomph”. 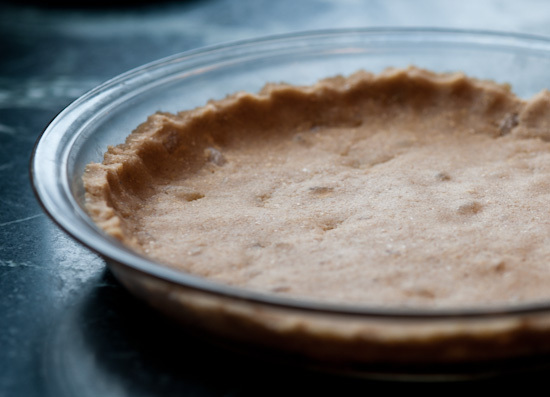 If you truly enjoy the other sort of pie crust, feel free to use your favorite recipe…hopefully one that’s not made with shortening as this is filled with hydrogenated oils/trans-fats. It’s better for you to use a combination of butter and lard from grass-fed animals (this combination produces a very flaky crust, too). You could also use a high quality store-bought or homemade graham cracker crust (use gluten-free graham crackers if you need it to be gluten-free). This pie is not at all fancy, but if you're looking for a homey, all-natural, not-too-heavy-or-sweet dessert for your Thanksgiving table, this would be a great choice. 1. In a medium bowl, stir together butter and sugar. Stir in yolks. Add flour, crystallized ginger, and salt, and stir until mixture just starts to come together (it will still be somewhat dry and crumbly). 2. Press dough into bottom and up sides of a 9-inch pie dish. Freeze for 20 minutes, or until firm, while you preheat oven to 375 degrees F.
3. Cover crust with a round of parchment paper and pie weights (I use about 2 cups of beans, which I store in a glass jar and re-purpose again and again). Bake, rotating halfway through, just until crust turns golden brown, 20-22 minutes. Allow to cool before adding the pie filling. 1. Process all ingredients in a blender or food processor. Pour into prepared pie crust and place in the oven. Cook in preheated 325 degree F. oven until the filling is just about set in the middle (it will continue cooking a bit after you take it out of the oven). This will take about 50-60 minutes; if the pie starts to brown, cover it loosely with foil while it finishes baking. 2. Allow the pie to cool in the refrigerator for at least 6 hours or overnight, and serve with homemade whipped cream to which you've added a healthy pinch of both ground ginger and cinnamon (I usually add a little organic powdered sugar to my whipped cream, too). 1 cup of organic cream makes about 2 cups of whipped cream, way more than enough for serving the pie. 3. Store leftovers in the refrigerator; in my experience, pumpkin pie does not freeze well. Crust adapted from Martha Stewart. I’m linking this post to Cheryl’s 3rd Annual Pie Party…Come join Love the Pie with TidyMom sponsored by Cherokee USA, Le Creuset, Wilton, Bags by Bloom and Harvard Common Press. I’m also “bringing” this pie to Food Network’s Virtual Thanksgiving: “The Communal Table”. Ahhhhhh… I love all of the wonderful squash you can get this time of year. What a great way of using it! Thanks Brian…I can’t get enough squash either! I need to get my hands on a kuri squash! I’ve never seen or heard of them and after seeing this, I’m very intrigued. What a beautiful pie…makes me want it to be fall all year when I see recipes like these! I’ve never even heard of Kuri, but I love the new direction my life has now been given. I just love the sound of this pie, and I really love that you used whole wheat pastry flour in the crust! Amazing. What a beautiful pie! I love the addition of the ginger in the crust! Loved the pictures and the squash…I have one with almost the same shape but a grey…. love the photos! so beautiful! How funny – we were kind of on the same page today, Winnie. I posted a kabocha – apple squash soup with coconut milk, and I had photos of the kabocha roasted and then just the peels, although I like your photos MUCH better. You’re giving me something to shoot for. And yes the kuri looks a lot like the red kabocha! I’ve never seen it, I’ll definitely keep my eyes peeled for some! It sounds like something I would really like! 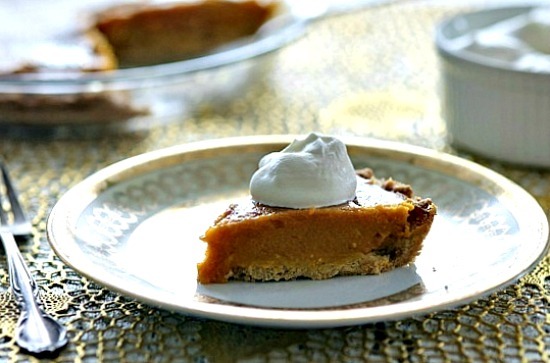 What a delightful & appetizing home made pumpkin pie! I love the crust too! Beautiful! I just had a kabocha yesterday and love how it’s so much less moist than pumpkin, too. I’ve never had kuri, but you can bet I’m going to look for it next time I’m food shopping! What a lovely pie… And, stunning photos of the whole process! Great minds think alike! This is such a gorgeous pie! The crust sounds especially delicious… yum!!! LOVE the ginger in the crust…Why do I feel woefully inadequate when people post about a squash I have never heard of? Wow, that’s beautiful, Winnie! I wish this wasn’t a virtual potluck! Oh My! I looooove your plate. It’s goegeous. You’re recipe sounds delicious as well. I’ve never had this kind of squash before, I’ll have to try and find it. I like the addition of ginger in the crust too. Ginger makes everything better! This pie looks gorgeous! I wish it could make an appearance on my Thanksgiving table :-) And I love the idea of your cookie crust. I will have to try this. I have never tried/even heard of red kuri squash before! 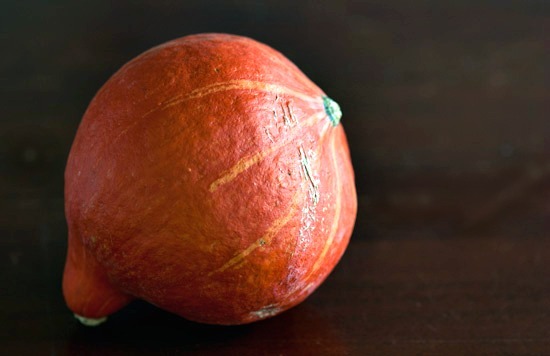 I am a huge fan of kabocha though, and by the looks of red kuri, the two are pretty similar! I have a feeling I’m going to love it. Thank you so much for this recipe, Winnie! What a beautiful looking pie! I’ve never had a squash pie before but I’m tempted now that I see how amazing they look and probably taste. Lovely Winnie. What a wonderful twist on a Thanksgiving classic. Your photographs are just stunning, my friend. Thank you for sharing with me! I hope you are having a great week and I wish you a wonderful weekend! WInnie! It’s beautiful. I love Kuri squash, but have yet to make anything with one this year. What a fantastic reminder to do so. You’re so right about the sweetness and texture, perfect for a pie. I have never heard of a red kuri squash before but I am super intrigued now. This dish looks scrumptious. Your shortbread crust has jarred this tried-and-true pie traditionalist. I may just forsake my buttery standby this year–your pie looks and sounds incredible! Oh Winnie, I really love this spin on pumpkin pie. Kuri squash is delicious. Putting this on my holiday list! Never tried this squash before but would love to try it after seeing this lovely post. The pie looks beautiful and I LOVE the plate and table setting. Exquisite! I had red kuri squash soup at a restaurant once and thought it was delicious. I bet this pie tastes fabulous. Thanks very much for the ping back. I’m happy to be sharing the Communal Table with you. Have a very Happy Thanksgiving.